Roadway and utility construction has begun on the final phase of estate-sized homesites in the master-planned community of Palencia. With sites ranging from 90 to 140 feet wide and 180 to 350 feet deep, the Costa del Sol neighborhood contains some of the most beautiful and expansive residential lots in the St. Johns County area. 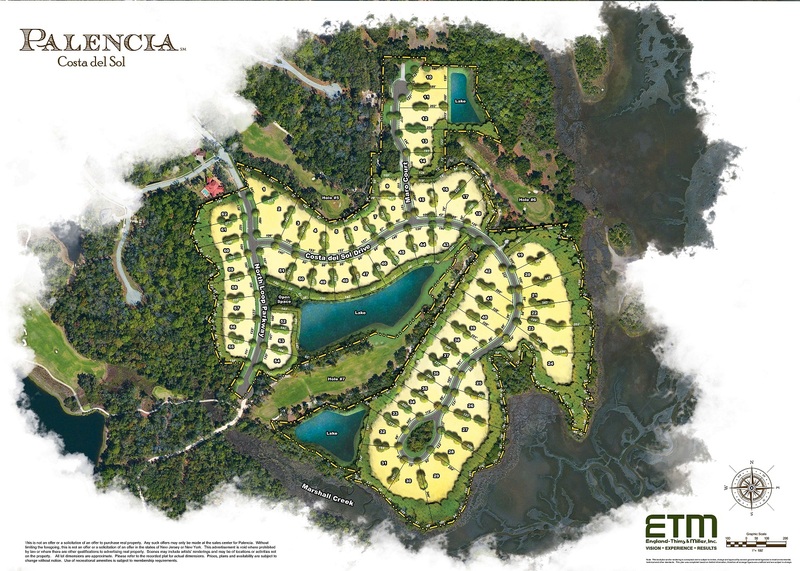 Many of Costa del Sol’s 62 estate homesites are nestled within a majestic oak hammock with stunning, mature trees and have beautiful views of the Intracoastal Waterway and the community’s award-winning golf course, including numerous water-to-golf view lots that are always the first to sell. The sites will be released for sale later in 2015; however, the Palencia sales team is presently registering interested buyers for an upcoming lot selection event. Preliminary lot prices range from $125,000 to $750,000. Costa del Sol buyers will be able to select from Palencia’s finest and most trusted builders – CornerStone Homes, The Cottage Home Company, Dostie Homes and Arthur Rutenburg Homes. Visitors to Palencia can tour three of the builders’ model homes in a model home park inside The Reserve II neighborhood. The park showcases the Palencia lifestyle and demonstrates the latest trends in new home design. Select lots will also be available for purchase with no time limit requirement to build for those who would like to secure the lot of their dreams but are not quite ready to follow with their dream home. All Palencia residents are within walking distance of the thriving Village Center, a European-style main street located in the heart of the community. It is one of the notable features of the community’s master plan that has established Palencia as the model for a truly integrated community development. The Village Center continues to add new retail establishments with offerings that range from a medical spa to a sports store to a yoga studio. Palencia residents also enjoy an array of resort-quality amenities, in addition to the Arthur-Hills designed championship golf course. The community offers three swimming pools including a heated competition pool, a full service fitness facility with a wide variety of classes and 10 Har-Tru lit tennis courts that are home to a complete flight of teams and numerous playgrounds. In addition to these active amenities, Palencia has gone to great lengths to allow residents to engage with and enjoy the surrounding natural beauty with an extensive network of neighborhood parks and walkways and a boardwalk and fishing pier extending almost one mile over the marshes and open water to the Tolomato River. Palencia is also zoned for some of the area’s finest schools, including Palencia Elementary, Pacetti Bay Middle School and Nease High School. All three schools have received an ‘A’ rating, and the highly competitive IB program is part of the curriculum at Pacetti Bay and Nease.